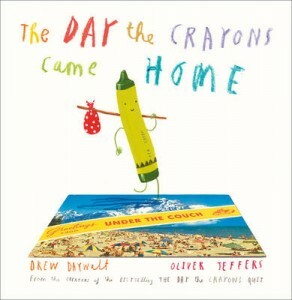 Following on from the phenomenally brilliant The Day The Crayons Quit comes the sequel. The crayons are back…and they are still not happy. This time around Duncan has to deal with the lost and forgotten crayons. The broken, chewed and melted crayons. And they are all, quite rightly, even more upset! These are the crayons who have been lost behind the couch, taken by the dog or in some cases deliberately runaway. There’s crayons who aren’t happy with the name of their colour so they decided to change their name, (you go Esteban!) and there’s crayons who can’t remember what colour they are anymore (it’s been that long!). There’s some new colours to meet and a couple of our old favourites (who may or may not have finally sorted out who is the real colour of the sun). Once again Drew Daywalt and Oliver Jeffers have produced a picture book that is an absolute joy to read out loud and share again and again (we still haven’t worn out the first book!). Oliver Jeffers’ wonderful illustrations are typically vibrant, absurd and brilliantly funny. And as with the first book each colour gives the reader the chance to read in a different voice for each colour, well at least that’s what I do anyway. This is another truly timeless picture book for the whole family to enjoy over and over again!